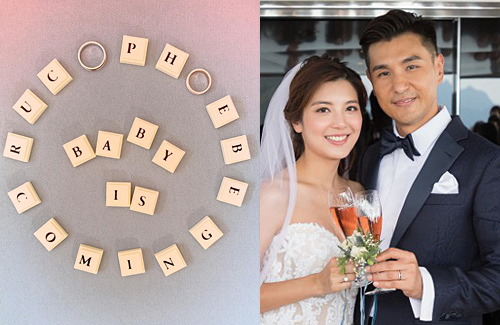 Last month, Ruco Chan (陳展鵬) and Phoebe Sin (單文柔) got married on a yacht and always said that they were ready to be parents. Fans didn’t have to wait long because the couple just released the good news that they’re expecting their first child. Many netizens and artistes sent their congratulations, including Selena Lee (李施嬅), Pal Sinn (單立文), Elaine Yiu (姚子羚), Carat Cheung (張名雅), Yoyo Chen (陳自瑤), Leanne Li (李亞男), and Vivien Yeo (楊秀惠)! As the news came shortly after the couple got married, many people are wondering if Ruco got married because of Phoebe’s pregnancy. The baby is expected to be born around April or May of next year and the gender of the baby is not yet known. Ruco doesn’t have a preference for the baby’s gender but knows that Phoebe wants a boy to carry the family lineage. As of now, Phoebe is three months pregnant and her belly is starting to show. When asked if Phoebe will give up her career to take care of the baby, Ruco will let Phoebe decide. He thinks Phoebe would like to continue to work especially since she has only worked in the industry for two years. Congratulations to Ruco and Phoebe! Their baby will be beautiful. for the insta posts, isn’t it the other way around?? but nonetheless, congrats to Ruco and phoebe! looking forward to seeing mini ruco or mini phoebe! @jcc10 Thanks for pointing this out. Just made the correction. Congrats to them! For all the talk of Ruco being traditional, he sure is progressive in a lot of things. I know i am going to sound like a fan girl, but he seems to have the best of old world and new world views. Chivalrous, hard working, loyal yet always saying, “my wife can choose what she thinks is best for her and her career”. We all thought Grace Chan is the one who’s supposed be pregnant but it turned out to be Phoebe congratulations to the Chan family!! Wonder if Pal Sinn and Phoebe are related? So happy for this couple. @littlefish In regards to ZLY and FSF, they could just be the highly superstitious type who don’t want to reveal/jinx anything until the baby is safely born. Just my speculation, considering how it’s pretty much an open secret that they had conceived prior to marriage. Seems silly to be hiding it for that reason, but I could be wrong. Anyway, no doubt that Ruco & Phoebe’s kid is going to be a looker, regardless of the gender. Congrats to them!! @sugarcane then explain the photo of her split trying to deny her pregnancy lol? Superstition is only before the first trimester is over, anything beyond that is ridiculous?